(Portland, CT) Chairman Rick Morin of the Middlesex County Chamber of Commerce has announced the winners of the chamber’s 35th Annual Golf Tournament held on Friday, May 4, 2018 at Portland Golf Course. 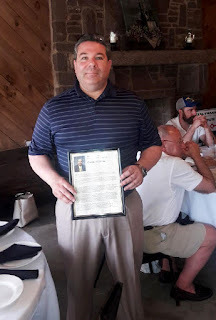 The Middlesex County Chamber of Commerce Robert Briggs Good Guy Award was given to Dante Fazzina, a commercial middle market senior relationship manager with KeyBank. The award is given annually to an individual for recognition of contributions made to the community and also to the Middlesex County Chamber of Commerce through the annual Golf Tournament.